One of two surgeons on the expedition, Macklin also had the job of driving a team of sled dogs and caring for the expeditions dogs. Most surgeons and doctors on Antarctic expeditions had little of a medical nature to deal with most of the time, but once on Elephant Island, Macklin and McIlroy, the other surgeon had much to attend to. Rickinson had a heart condition, Blackborow had gangrene in his toes several of which were amputated, Hudson was having a nervous breakdown and suffered an infected boil. There were many other cases of frostbite, dysentery, boils, sores etc. 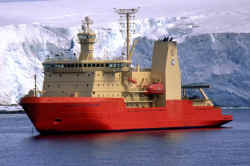 that meant that both surgeons were best left on Elephant Island rather than accompanying Shackleton to South Georgia. Macklin was the son of a doctor, he was born in India, when the family returned to England, they settled in the Scilly Isles off the coast of Cornwall where his father set up practise. After a short spell working as a deckhand, Macklin read medicine at Manchester University, it was very shortly after qualifying that he applied for the Endurance expedition. On return to England, Macklin Joined the army as an officer in the Medical Corps serving in France and Russia during the First World War. He served first with the Yorks later transferring as medical officer to the Tanks. Going to the Italian front with his battalion, he won the Military Cross (M.C.) for bravery in tending the wounded under fire. 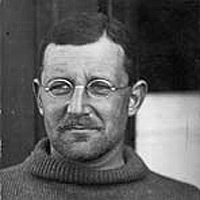 Shackleton invited Macklin to join him again for the Quest expedition in 1922, which like many of the old Endurance crew, he was happy to do so. 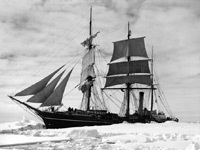 As the ship's surgeon, on Shackleton's death at South Georgia, it fell to Macklin to prepare the body initially for transport to South America and then for burial on South Georgia. Back home, he moved to Scotland and set up a practise in Dundee where he remained from 1926 to 1947. In the Second World War, he was a Lieutenant Colonel in the Medical Corps, serving in East Africa. In addition to the M.C. (Military Cross) awarded in WW1, he also received the T.D. (Territorial Decoration) and later the O.B.E. (Order of the British Empire ). At the age of 58, he married and moved further north to Aberdeen working in various positions in Aberdeen hospitals before retirement in 1960. He died aged 77 in 1967. The training of dogs has commenced - soon their services will relieve us of a great deal of not unpleasant work in bringing in distant seals. Wild, Marston, Crean, Macklin, McIlroy and Hurley are the dog men: none of them has any preliminary experience to speak of, but this does not seem at all essential. We are fortunate in having two doctors. McIlroy and Macklin, co-equal colleagues. They seem to take cases indiscriminately but whichever one one happens to see, that one attends one until one is better. Macklin is a Scotchman born and bred in the Scilly Isles where his father is one of the leading practitioners. Educated at Plymouth College and Edinburgh University, he held a position in a hospital in Manchester before joining the expedition. Though he gives no indication of it in his voice, he yet has the main Scotch characteristics. Rather quick-tempered, he is at the same time a thorough sportsman in the best sense, but he lacks McIlroy's bedside manner. He is a first-class rugby football player in spite of the fact that he wears glasses. He is one of our hardest workers, continually out amongst his dogs even in the most inclement weather. Both doctors have dog teams and have developed into very efficient drivers. It seems funny work for doctors to be doing. Macklin ran to the snow-slope and fixing his jacket on to the lanyard of the oar doing duty as a mast over the old ice-cave, hoisted it as well as the running gear would permit, which was only about half-mast high, an which Sir Ernest afterwards told us made his heart sink, as he took it to be a sign that we had lost some of our number. The quarters in the 'tween decks were completed by the 10th, and the men took possession of the cubicles that had been built. The largest cubicle contained Macklin, McIlroy, Hurley, and Hussey and it was named "The Billabong." The dogs had been divided into six teams of nine dogs each. Wild, Crean, Macklin, McIlroy, Marston, and Hurley each had charge of a team, and were fully responsible for the exercising, training, and feeding of their own dogs. They called in one of the surgeons when an animal was sick. We were still losing some dogs through worms, and it was unfortunate that the doctors had not the proper remedies. Worm-powders were to have been provided by the expert Canadian dog-driver I had engaged before sailing for the south, and when this man did not join the Expedition the matter was overlooked. "This afternoon Sallie's three youngest pups, Sue's Sirius, and Mrs. Chippy, the carpenter's cat, have to be shot. We could not undertake the maintenance of weaklings under the new conditions. Macklin, Crean, and the carpenter seemed to feel the loss of their friends rather badly. Rivalries arose, as might have been expected, and on the 15th of the month a great race, the "Antarctic Derby," took place. It was a notable event. The betting had been heavy, and every man aboard the ship stood to win or lose on the result of the contest. Some money had been staked, but the wagers that thrilled were those involving stores of chocolate and cigarettes. The course had been laid off from Khyber Pass, at the eastern end of the old lead ahead of the ship, to a point clear of the jib-boom, a distance of about 700 yds. Five teams went out in the dim noon twilight, with a zero temperature and an aurora flickering faintly to the southward. The starting signal was to be given by the flashing of a light on the meteorological station. I was appointed starter, Worsley was judge, and James was timekeeper. 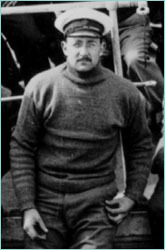 The bos'n, with a straw hat added to his usual Antarctic attire, stood on a box near the winning-post, and was assisted by a couple of shady characters to shout the odds, which were displayed on a board hung around his neck, 6 to 4 on Wild, "evens" on Crean, 2 to 1 against Hurley, 6 to 1 against Macklin, and 8 to 1 against McIlroy. Canvas handkerchiefs fluttered from an improvised grand stand, and the pups, which had never seen such strange happenings before, sat round and howled with excitement. The spectators could not see far in the dim light, but they heard the shouts of the drivers as the teams approached and greeted the victory of the favourite with a roar of cheering that must have sounded strange indeed to any seals or penguins that happened to be in our neighbourhood. Wild's time was 2 min. 16 sec., or at the rate of 10Ã‚Â½ miles per hour for the course. On the following day Wild, Hurley, Macklin, and McIlroy took their teams to the Stained Berg, about seven miles west of the ship, and on their way back got a female crab-eater, which they killed, skinned, and left to be picked up later. They ascended to the top of the berg, which lay in about lat. 69°S., long. 51°W., and from an elevation of 110 ft. could see no land. The apathy which seemed to take possession of some of the men at the frustration of their hopes was soon dispelled. Parties were sent out daily in different directions to look for seals and penguins. We had left, other than reserve sledging rations, about 110 lbs. of pemmican, including the dog-pemmican, and 300 lbs. of flour. In addition there was a little tea, sugar, dried vegetables, and suet. I sent Hurley and Macklin to Ocean Camp to bring back the food that we had had to leave there. They returned with quite a good load, including 130 lbs. of dry milk, about 50 lbs. each of dog-pemmican and jam, and a few tins of potted meats. When they were about a mile and a half away their voices were quite audible to us at Ocean Camp, so still was the air. The ice between us and Ocean Camp, now only about five miles away and actually to the south-west of us, was very broken, but I decided to send Macklin and Hurley back with their dogs to see if there was any more food that could be added to our scanty stock. I gave them written instructions to take no undue risk or cross any wide-open leads, and said that they were to return by midday the next day. The next day I sent Macklin and Crean back to make a further selection of the gear, but they found that several leads had opened up during the night, and they had to return when within a mile and a half of their destination. We were never able to reach Ocean Camp again. Still, there was very little left there that would have been of use to us. I called the men together, explained my plan, and asked for volunteers. Many came forward at once. Some were not fit enough for the work that would have to be done, and others would not have been much use in the boat since they were not seasoned sailors, though the experiences of recent months entitled them to some consideration as seafaring men. McIlroy and Macklin were both anxious to go but realized that their duty lay on the island with the sick men. Another fierce gale was blowing on April 22, interfering with our preparations for the voyage. The cooker from No. 5 tent came adrift in a gust, and, although it was chased to the water's edge, it disappeared for good. Blackborow's feet were giving him much pain, and McIlroy and Macklin thought it would be necessary for them to operate soon. They were under the impression then that they had no chloroform, but they found some subsequently in the medicine-chest after we had left. A census was taken, each man being asked to state just what he would like to eat at that moment if he were allowed to have anything that he wanted. All, with but one exception, desired a suet pudding of some sort, Ã‚Âthe "duff" beloved of sailors. Macklin asked for many returns of scrambled eggs on hot buttered toast. There, just rounding the island which had previously hidden her from our sight, we saw a little ship flying the Chilian flag. Description: Mountain having 2 peaks, the higher 1,900 m, between Mount Carse and Douglas Crag in the S part of the Salvesen Range of South Georgia. Surveyed by the SGS in the period 1951-57, and named by the UK-APC.